What Is Prolific.ac? Prolific Review! Surprise Surprise! Last updated on February 18, 2019 By Nat 2 Comments This post may contain affiliate links. We appreciate you supporting Rags To Niches! Full disclosure here. What Is Prolific.ac? Is Prolific Legit? In a word…. YES! Prolific, (also known by many as “Prolific Academic,” is unlike any survey panel I’ve ever come across and definitely the highest paying. During my Prolific review today, I will share my own personal experience with the platform, the pros vs cons, some tips for you to keep in mind and some unique features that set this apart from other sites. Overall Verdict: Brilliant! This is something completely unique when it comes to survey panels. Interesting surveys, decent pay per survey and NO screen outs. So, if you’re used to being screened out from big survey panels like Global Test Market,or Ipsos-Isay, you will be pleasantly surprised here. The only way you’ll be thrown off a survey here is if you aren’t reading the instructions and give inconsistent answers. The first three surveys I’ve completed have been only 10-15 minutes long too. Also, the minimum wage they drop to is £5 per hour, so you can guarantee that whatever survey you’re taking has to measure up to that. For example, you would need to be paid a minimum of £1.25 for a 15 minute study and it could be quite a bit more. Click here to sign up. Prolific invites you to participate in studies for academic research. So, every study you participate in, will be a genuine research project and they are looking to find the ideal candidates to participate in them. Each study will involve a set of instructions, various scenarios that you have to place yourself in and a series of questions. You may be instructed to watch a video, or even play a game. For every study you complete, you will be compensated for your time with a small amount of money. It’s simple to sign up with basic details – but you do have to provide a mobile number. They use your mobile number to verify your account and you will also need to verify your email address before you can complete any surveys. On the far right is where you can find a drop down menu to access things like your account details. Before you see any studies waiting for you, there are a lot of profiling questions to get through. Completing the profile section is going to be necessary to complete ASAP. You can then be matched with appropriate surveys, (or “studies,” as they call them). One profile section had 46 questions! I decided to take them all at once to see how long it would take me. In total, it took 40 minutes to answer all the questions. When I went from here to check my studies section – there were three studies there available for me right away!! They all seemed to pay quite well too. Between £1-£2 and only for 10-15 minutes. I was pleasantly surprised. I decided to go for the highest paying study – which was £2.00 for 15 minutes. It took me almost exactly 15 minutes to complete, so it was an accurate estimation time wise. The study itself was very interesting, unlike anything I have ever taken survey wise and for £2 – it was really pretty good going as far as survey sites went. You don’t get paid immediately, your study goes into “submissions,” and from there it needs to be approved. I noticed they stuck in a few trick questions in there to make sure that you are paying attention. So, do not just tick boxes randomly – read the questions carefully and think about your answers. I took another test that was 10 minutes for £1.84 – this has to be completed via mobile and was a little tricky, but seemed work fine and included playing a memory game. The final test I took was for £1.47. This test was interesting again and actually was quite unexpected! I won’t delve into the details, as you may have a similar study yourself – but let’s just say it was enlightening. Overall, I spent around 35 minutes on the three studies and if they are all accepted, I will have made over £5. That has to be the most I’ve made in that amount of time doing online surveys…. and they were actually enjoyable too. No, £5 is not a tonne of money. But it’s not bad for 35 minutes work doing something you enjoy! If you want to make more money online than this, it’s better to look beyond survey sites think about starting your own business online – which is what I did here. What Is Unique About Prolific? There is a lot to like about Prolific and there are some key things that sets it apart from other regular survey panels. With most survey panels – you’ll be faced with many profiling questions to complete and yet they don’t seem to make any difference! No matter how many profiling questions you answer, you still end up getting screened out for a majority of them! In this case, you don’t get screened out of surveys. You’re already matched to the survey before it is sent to you and because these studies are so different in nature to the sort of surveys you may be used to, I imagine they are open to a wider demographic than traditional surveys. You get paid much better for your time! 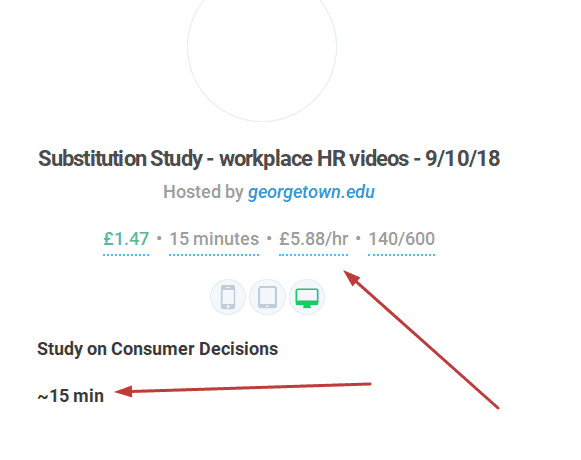 With some surveys paying pennies for you to complete surveys, these studies seem to pay you a little more generously for your time. Over £5 for a little over half an hour is pretty good! (And phenomenal if you compare this to other survey panels). You get to play a part in actual academic and scientific studies! The answers you give are actually going to a worthwhile cause. It just feels good to be a part of someones hard work and be invited to participate in their research. When I was at university, I would regularly partake in student studies. I’d often get compensated a small amount for my time but, more than that, I just enjoyed participating in them. So, this feels very similar to that – except I can do it from the comfort of my sofa. You get some extra info about the study before you complete it. For example; you’re told how much you’re paid and how this compares to an hourly wage. In the case above, it’s still below minimum wage, but a lot better than many sites where you’d be lucky to make £2 an hour! In some sense it’s a little misleading, because of course you may only get one study a day worth 50p for 10 minutes – but I think it’s still a really nice touch that they ensure you won’t get a rate of less than £5 an hour and it’s often more. If only they had more surveys! You don’t relentlessly have to answer the same questions again and again! Usually, regular survey panels often ask you to complete extensive profile questions – you still seem to have to repeatedly answer these type of questions every time you complete a survey. With Prolific, you answer a large amount of profiling questions ONCE and this seems to match you correctly with suitable studies for you. Occasionally, you may be asked a few questions during the survey, such as your age. But there are only a few of those and they don’t drag on. You know more information about who created the survey! When you’re about to complete a study, you can read a bit about it and the researcher who is behind it. You are told beforehand how the information from the study will be used, (you will always remain anonymous). This is in stark contrast to regular survey panels, where you generally know nothing about who is behind the survey you’re doing, or how this information they’re collecting will be used. Who Can Sign Up With Prolific? I initially thought that Prolific was UK only. While Prolific is based in the UK, it is open to many Universities worldwide. I imagine that the studies available are going to vary significantly, depending on your location and some areas may have vastly less available. At the present time, you can sign up to Prolific from the following Countries: AT, AU, BE, CA, CH, CL, CZ, DE, DK, EE, ES, FI, FR, GB, GR, HU, IE, IL, IS, IT, JP, KR, LU, LV, MX, NL, NO, NZ, PL, PT, SE, SI, TR, US. Are you outside the UK? What is your experience with Prolific so far? Let me know in the comments. Low payout threshold – you can cash out from only £5, which is excellent! However, there is a payout fee on less than £20 and it wouldn’t take to long too reach that so, I will be waiting until I reach £20. You can cashout via PayPal. NO screening out! You participate in studies that you are already eligible for. A higher rate of pay than other survey related panels. You get to participate in real academic and scientific research and you can see that all researchers are attached to a student email, which just confirms their legitimacy. Studies aren’t going to be flooding through constantly. You’re going to have times when there won’t be much available so, you’ll have to keep checking back. You don’t get paid immediately, as you will need to wait for your submissions need to be approved. 1. Make sure to complete all the profile questions on the dashboard. This will give you the best chance of being sent studies. 2. Check back regularly. Each study will have a limited number of required participants and once that quota is filled, the study will be gone. 3. Read the questions very carefully and answer truthfully. Prolific add some little sneaky questions in there to try to trip you up. Your submission will be rejected if you fail any of these attention tests. *Important – I actually failed one of these attention tests and one of my tests was rejected – even though I thought I’d been paying attention, I got caught out, so be careful! 4. Some say they have better luck checking studies during they day. This can be difficult to do if you have a regular full-time job. But it could be worth taking a peak in the morning before work, if you have time. 5. Have your phone ready and log in details saved to your mobile device – as you do get some studies that are mobile only! How Much Can You Make With Prolific Academic? As I mentioned before, it cannot be less than the minimum of £5 an hour. But that could also mean 30p for answering a mini survey. How much you can earn depend on many variables though. Such as, how many studies you are available on your dashboard, (depending on how you answer your profiling questions and are matched to studies) and how much each study pays. 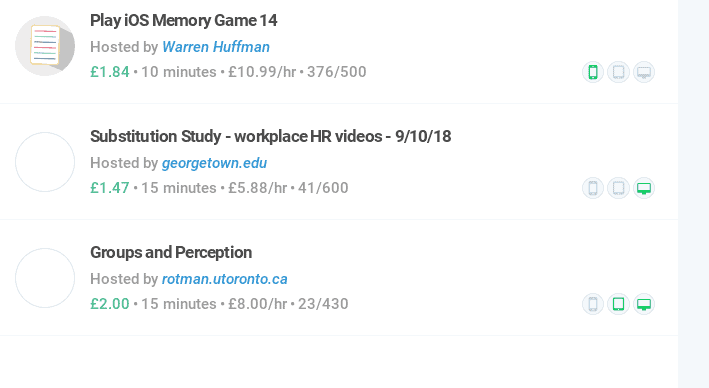 The highest study I’ve had so far was for £2 – but they could be for £4 or more. Prolific also have a referral program. If you recommend the panel to other people you know, such as friends and family, you can earn 10% of everything they make. This 10% doesn’t’t come out of their earnings though, it’s an additional payment that Prolific pay to you. From my experience so far, this is a really good example of how a survey panel SHOULD be. If only all panels could be like this, they’d all have great reviews from me. The biggest plus points for me? No screen outs, interesting surveys and reasonable pay for your time. There isn’t much here not to like. There is no way of knowing how many studies you’ll be eligible for until you check it out – just make sure you do fill out all those profiling questions and some studies may pop up on your dashboard right away. Prolific is great for passing the time and making a small amount of extra money here and there. If you’re looking for a legitimate survey panel, this is absolutely one of the best I’ve reviewed to date. But if you’re looking to make more online in the long-term, you need to look beyond things that simply pay you for your time and think about growing your own business online. Where I discovered how to grow a business online. How to make money from a simple blog/website. 40+ ways to make your first dollar online. Thanks for the great review. I am not a huge fan of survey sites, but I do like the few differrences that Prolific seems to have fom the others. I like that the payout is reasonable and that the information obtained is used for real scientific studies. I don’t know if it’s worth my time, but if I ever have the downtime I will give it a go and see how I like it.